The new semester at Rutgers University has begun with a huge attendance of students at the first "Shabbaton" - Jewish Unity Dinner on Friday, Jan. 24, 2009. Over five hundred young men and women streamed into the lavishly decorated ball-room of the largest Chabad House in the USA, and partook in the Shabbat Friday eve services, followed by a five-course meal. The Shabbaton theme was "Heaven on Earth", and featured song, brief 'Torah Messages', and Shabbat wine, fresh home-baked Challah, Gefilte Fish, Chicken Soup, Salads, Roast Chicken, and assorted Israeli salads. All students were welcomed by the student-run Chabad House officers, and the Shabbat evening joy went till the wee hours of the morning. 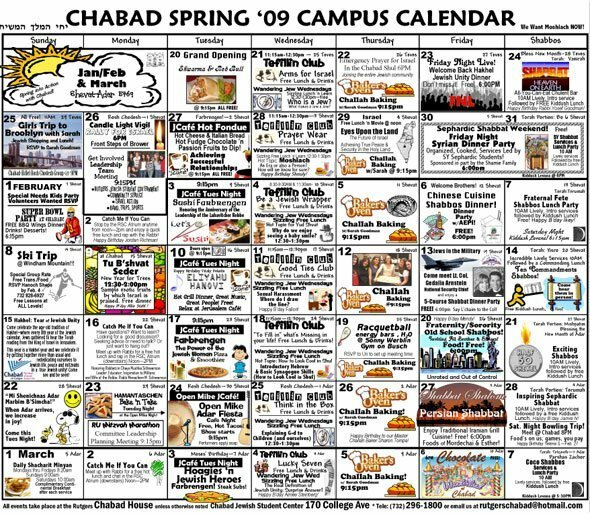 Rabbi Baruch Goodman, Director of Student Activities at Chabad, stated, "Once again, we are experiencing a banner year. As this is the year of "Hakhel" -Ingathering according to our calendar, may our work be the catalyst for the "Ingathering of our entire People of Israel", through the coming of Moshiach." Future programs and Shabbaton dates and themes are available at here. The programs will include Syrian Shabbaton Party, Chinese Shabbatons, U.S. Military Shabbatons, Persian Shabbatons, and Chocolate -Coco Shabbatons. In addition, regular weekly programs include an International Coffee House every Tuesday evening, a Super Bowl party, a ski trip, and weekly Challah Baking Classes.